Philips will be showing off a huge range of gadgets at next year’s CES 2009 show in early January, but it can’t seem to wait until then to tell us all about what will be on offer. So it’s released details of some lovely new wireless Hi-Fis and iPod docks that it’ll be launching in the new year. First up is the announcement of two new Philips Streamium wireless Hi-Fis, the Philips Streamium MP2500 and the more capable (and louder!) NP2900 (top). As you can see from the pics, they’re both rather good looking. They’re at the cheaper end of the Streamium spectrum, and so don’t offer all the bells and whistles you get from the more high-end sets. What you get instead is a 32W amp and four speakers (in the case of the NP2900), a large screen, and the ability to wirelessly connect to your PC, from which it’ll stream Internet Radio channels, MP3 tunes stored on your hard drive, or music from RealNetworks’ Rhapsody service. The NP2900, then, is basically a music streamer without any means of playing tunes itself, and so competes directly with the Logitech Squeezebox and other such gadgets. This is becoming an increasingly crowded market as the idea of streaming your digital music from where it’s stored (your PC) to where it sounds best (your Hi-Fi) finally catches on. We’ll producing a report of the best music streamers in the new year, so stay peeled! 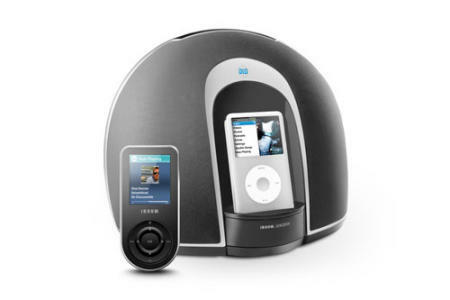 As well as new Streamiums, Philips will also be showing off new iPod docks at CES 2009. 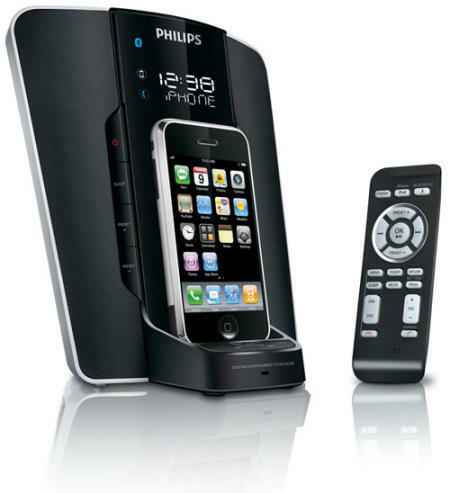 The first, the Philips Docking Entertainment System DC350 (left), is a rather grand looking unit that envelopes your iPod Touch or iPhone, and comes with a remote control from which you can control the tunes you want to play. It’s also a clock radio, and comes with Bluetooth, so you can make and take calls via your iPhone with it. Only 6W of power output, though, which is a bit weedy, but at $150, it should be a nice addition to your bedroom if you’re the type who cant get out of bed until you hear the right tune in the morning! In addition to the DC350, there’s also the Philips DLO iBoom (left), which features a remote control that in many respects is as big as the iPod it’s used to control! Makes you wonder why the iBoom comes with an iPod dock at all – why don’t Philips simply provide it as a speaker, an amp, and a big cable into which you plug your iPod?! Anyway, the iBoom will set you back $200 if you’re interested. 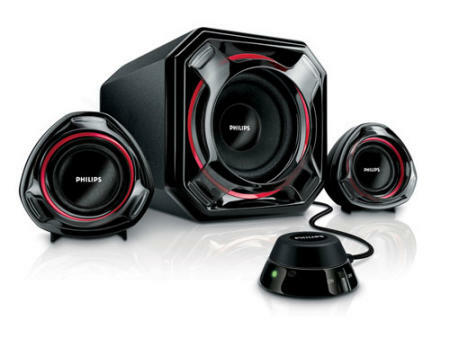 Finally, Philips will also be showing off the SPA5300, a set of flash-looking 2.1 multimedia speakers for your PC, complete with remote control. This is an odd time of year for gadget makers, with Christmas just around corner, followed directly after by the biggest gadget trade show of the year in the form of CES 2009. As such, the manufacturers are usually focused on selling their current wears as hard as they can, and don’t worry about hyping their future products until the new year. The fact that Philips and others are starting the hype now, reflect perhaps the challenging retail climate we’re currently in, and how everyone has written off this Christmas, and will be focusing instead on drumming up trade for next year. CES is certainly going to have a different feel about it next month, that’s for sure!